Survivors of a lunar explosion hurtle aimlessly through space on the moon itself, and encounter all manner of aliens and natural phenomena. As they journey through space, their very human outlook is challenged by their interactions with new life forms, while new philosophies emerge. 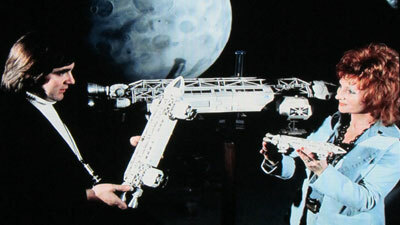 Anderson had a reputation in the 1960s and 1970s for producing thrilling science fiction television shows, mostly with marionettes and stunning miniature effects. His puppet programs reached their height of popularity with 1965’s Thunderbirds, but that show was followed by two more successes— Captain Scarlet and Joe 90. It was only after the unfortunate failure of 1969’s Secret Service that Anderson left the Supermarionation process behind, and he embarked on a new career of live action productions. The first of these was UFO, which had a well-received initial season in 1970-71 (later in US syndication), a season that saw mankind being protected from invading aliens by an organization which included a moon base as part of its operations. After UFO earned an order for a second season, extensive development went into the sophomore season, with planning and design work done for expanded moon sets and bigger action. However, the second season order fell through as U.S. ratings declined, and Anderson and his partners formed a new independent production company named Group Three. They took an order from Britain’s ITC television company for a contemporary detective action show, which became 1972’s The Protectors, successfully running for fifty-two half-hour episodes. With production on that series running down, Anderson revisited the pre-production work done for UFO’s proposed second season. 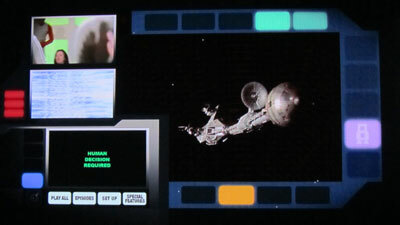 Star Trek’s rising popularity in syndication, in addition to the promise of recouping already-spent monies, likely helped Anderson to secure the commitment from financer Lew Grade needed to produce what became Space: 1999. Once ITC’s funding was supplemented by Italy’s RAI, Group Three’s production on the new show seemed imminent. They just needed a premise. ITC’s American office was keen to make a sale to the U.S. market, and they insisted on a few key items. For one thing, the new show had to take place entirely off Earth. They also wanted an American to direct the pilot, to make sure that the show would cater to American sensibilities. Additionally, they wanted Martin Landau and Barbara Bain, the husband and wife team that had starred on the hit show Mission: Impossible, to be cast as the leads on the new space show. This, they insisted, would ensure a sale to the U.S. market. After some excruciating negotiations, a deal was struck with the couple. 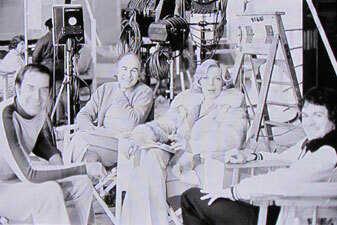 They and the director headed to Pinewood Studios, where production began at the end of 1973. 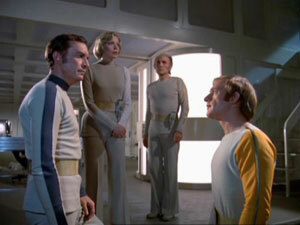 The premise of Space: 1999 is both engaging and fanciful, even if the show seemed to aim for a “hard” sci-fi feel akin to the similarly titled 2001: A Space Odyssey. 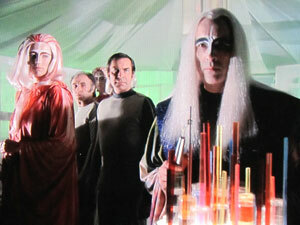 Unfortunately, the writers of Space: 1999 didn’t actually seem to know much about science. 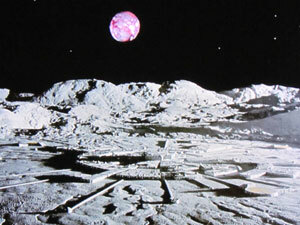 Putting that aside, though, one can appreciate the nifty concept seen in the first episode, Breakaway, of a moon base staffed by 311 people and victimized by an accident that places them on a trek through the stars. 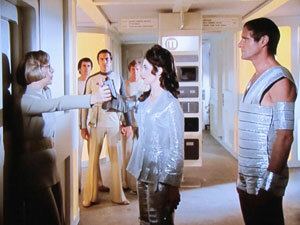 Moonbase Alpha was set up for research and to assist with deep space exploration, particularly to the planet Meta, where mankind hoped to settle. It is made clear in the pilot that the mission to Meta is critical for the human race’s survival. 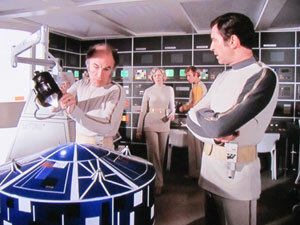 Unfortunately, Moonbase Alpha also had had to take on the role of monitor for a nuclear waste depository on the moon. This waste began to accumulate significantly after a thermonuclear war and resulting peace treaty that took place in 1987. On September 13, 1999, Commander John Koenig (Landau) takes over command of Alpha due to serious problems on the base, though Koenig only learns of the real issues after he arrives; that is, that several astronauts essential to the Meta mission were critically ill from an unknown cause. Like Captain Kirk, Koenig has two main confidantes. Dr. Helena Russell (Bain) is the Chief Medical Officer, providing counsel from both a medical and humanistic perspective. Professor Victor Bergman, played by Barry Morse (The Fugitive), is a civilian technological advisor who addresses philosophical issues as adeptly as he does scientific ones. Russell and Bergman make a discovery about danger in the nuclear waste area. Before a solution can be fully implemented, disaster strikes. A spike occurs in magnetic radiation, and the nuclear material explodes. The moon is torn out of its orbit, sending it off into space. 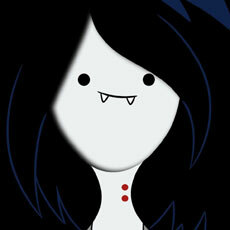 (The show’s initial concept had also involved aliens, but that aspect was dropped in the final script.) An uncertain future awaits them, though there is a slim hope of reaching Meta. In this sense, the series is now reminiscent of later shows Star Trek: Voyager or Battlestar Galactica. The second episode in production order was A Matter of life And Death. 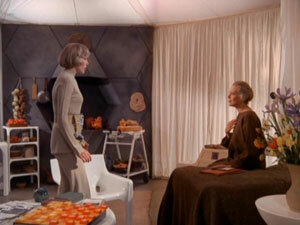 Here, the first planet they reach is called Terra Nova, and the Alphans encounter Dr. Russell’s long-presumed husband. They can’t stay on the planet, however, as… it’s not totally clear, but it has something to do with anti-matter, and being incompatible with human life. It all sounds cool, until you try to analyze what it all means. Still, the exploration of a dead man’s seeming return and what it does to the main characters is interesting. 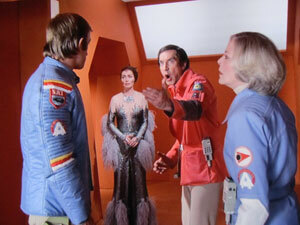 And, for not the only time in the show, we see the Alphans react to losing out on what first appeared to be a new home. 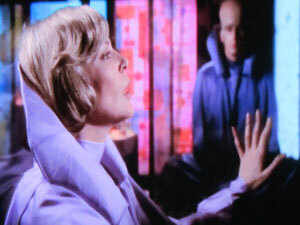 The initially planned second episode, Black Sun, was third on the production schedule, but only ended up airing as episode ten in both the UK and the US (a full two months after the first episode was shown). It was in this episode that the moon is thrown out of its home solar system by travelling through what we now commonly call a black hole, travelling hundreds of light years away, where planets and solar systems are apparently much closer together. (It is a little funny how the characters know so little of black holes here, while we now know that people in 1999 were quite familiar with the concept.) This at least attempts to explain how the moon, assumedly travelling well below light speed, can encounter so many other planets, when the nearest solar system to our own is 4.3 light years away. Fortunately, the episodes on this Blu-ray set are presented in production order; 1975 viewing audiences were left perplexed as to how Moonbase Alpha had been encountering so many aliens before even leaving our solar system! Black Sun ends with a somewhat trippy and intriguing sequence where Commander Koenig and Prof. Bergmen age rapidly and pontificate on the meaning of all things, while meeting an omnipotent being, who is suggested to be a female God. After seeing this episode, you know you’re not just watching a Star Trek wannabe. Philosophy and metaphysics play a large role in this show’s first season, perhaps more than actual science does, given the wonky nature of the science presented on the series. Whether we consider the unlikelihood of the moon encountering so many planets in the space of a few months (regardless of where in space it is), the questionable nature and strength of the important explosion caused by nuclear waste, the incorrect description of there being a “dark side” of the moon, or Dr. Bergmen describing how “we’ve known for a long time that plants talk to one another,” inaccuracies abound. You may find yourself flabbergasted by the lack of medical or scientific knowledge shown by Prof. Bergmen and Dr. Russell, who so often seem to be confident but clueless. Not to mention oddities like seeing Dr. Russell using a typewriter, the massive computer banks, or the bizarre reliance on remote controls to open doors. You shouldn’t watch this show for the science or its predictions of the future; watch instead for the ideas, adventure, and loopy stories. Loopy stories? Yes, some of them are brilliantly loopy. In Ring Around The Moon, a man’s brain becomes a relay station for an enemy probe. Koenig’s soul ends up in a type of alien heaven in Missing Link, and he is seduced by a beautiful woman, while his body slowly dies at Moonbase Alpha. In Force Of Life, an Alphan becomes a heat-seeking killer after being enveloped by a strange orb of blue light. The first child born on the moon develops extraordinarily rapidly in Alpha Child, and it turns out he is just one of many aliens intent on taking over the bodies of the Alphans. Alphans devolve into Cro Magnons on the planet Retha in The Full Circle. The loopiest episode may be The Troubled Spirit, where nasty events are started with a scientist’s weird experiments in communicating via brain waves with his plants. There are many highlights, however, in a season full of intriguing plots. In Earthbound, several aliens on their way to earth, including the wonderful Christopher Lee, are awakened from suspended animation after they crash on the moon. Another Time, Another Place features the Alphans encountering a future timeline when the moon has returned to Earth orbit. Voyager’s Return involves a polluting Earth probe, an inventor in hiding, and aliens seeking revenge. A powerful alien offers Alphans lifetime security in exchange for using them as toys for his amusement, only to strike out in anger when refused, in End Of Eternity. The Last Enemy sees Moonbase Alpha caught in-between two warring planets, who see the moon as an ideal base of attack, necessitating Koenig trying to broker peace. Leo McKern guest-stars in The Infernal Machine as The Companion, a dying alien whose psychic link with his vast ship places Alpha in peril. The birthplace for humanity is apparently discovered on the planet Arkadia, in The Testament Of Arkadia. Episodes like these show immense creativity and create food for thought. 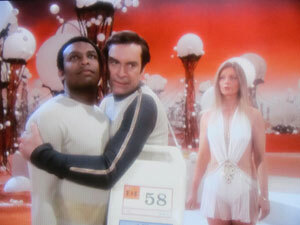 At its best, Space: 1999 offers thoughtful writing and entertaining plots. To truly appreciate the show, it helps to accept it for what it is. The writers were interested not so much in science as they were in using bizarre adventures to illuminate the human condition. Many of the episodes take on almost dreamlike qualities, with characters in trances or being otherwise taken over by alien minds. The issues that the Alphans have to deal with force them to examine their belief systems as well as their presuppositions about the universe. This show has been ridiculed in the past for its lack of true science, yet in many ways it is one of the more cerebral sci-fi shows to have ever aired. It is a show about ideas, and man’s reaction to new phenomena. At its core, though, Season One is about human origins and identity, with a steady undercurrent of exploring man’s destiny and purpose. As a kid, I sometimes found the show dull, due to the philosophising of Prof. Bergmen, and the idealism vs. pragmatism debates between John and Helena; but watching these again I found I really love the show. 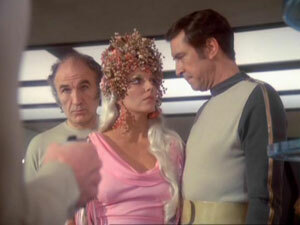 Space: 1999 sometimes aims too high and comes off as pretentious or naive, but I’d rather watch something that aims high and stumbles as opposed to aiming low and woefully succeeding. 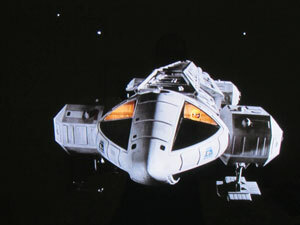 Aside from the interesting plots, one more reason to enjoy Space: 1999 is the incredible work done by the model department and special effects supervisor Brian Johnson. 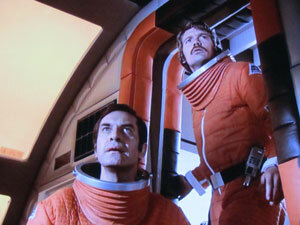 The effects are top rate, and compare extremely well with the work that Johnson did on 2001: A Space Odyssey. The odd monster-in-a-rubber-suit may rear its cheesy head, but for the most part the special effects are superb, particularly the shots of spaceships in flight. 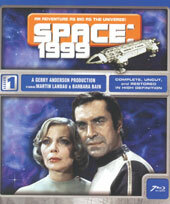 As a bridge between the cult of Star Trek and the revelation of Star Wars, Space: 1999 provides a unique spin on outer space stories. The show would evolve further in the following season, with changes to its cast and costumes, and a new emphasis on action. Those episodes are fun, but in many ways I appreciate the first season the most, for its intellectual handling not of science, but of the human condition. Oh, yeah. This set is very loaded. As a long-time fan, I was quite thrilled with the contents of this set, which includes two full standard DVDs of bonus content, aside from the features that accompany the other five discs in the set. 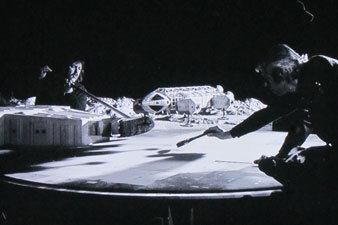 Some features are common to all the discs, with Image Galleries for every episode (with runtimes of 3-4 minutes each), in addition to additional goodies like Behind-The-Scenes shots, close-ups of miniatures or special effects set-ups, the aging makeup for Black Sun, portrait shots of the cast, some original contact sheets, shots of a deleted scene from End Of Eternity, a few storyboards, Lew Grade’s visit to the filming of Earthbound, and even shots of Roy Dotrice (Commissioner Simmonds) doing a segment of This Is Your Life on the set of Space: 1999. Disc 5 has some special image galleries that really tickled me. The Bassett Sweet Cigarette Cards (5:12) and Donruss Chewing Gum Cards (3:33) galleries show off every card in each series, front and back. 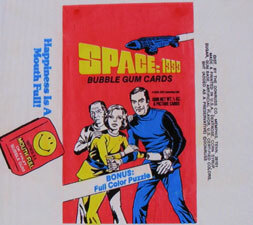 I actually remember having some of the chewing gum cards, and was delighted to finally see the complete picture that the backs of the cards made when they were all placed together. This same disc has Unfinished Opening Titles (2:25), with two different versions and no text. There are also Textless End Titles (0:32). Then there is the mysteriously named Textless Episode Material (18:29), which are quick bits and pieces of background and effects shots used following the show’s opening sequence in various episodes. 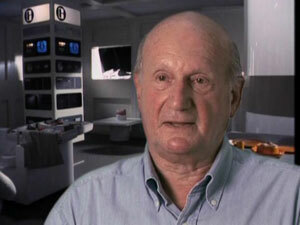 Gerry Anderson did Audio Commentaries for two episodes, Breakaway and Dragon’s Domain. The Commentary for the pilot was actually done for the old DVDs, and is somewhat spotty. However, it’s worth skimming through it to hear more about the origins of the show, from its use of second “series” UFO production work, to the tricky wooing of Landau and Bain. We also find out that Anderson himself had to re-cut the episode and shoot additional scenes when the American director failed to deliver an appropriate length cut. His second commentary seems to be more recent, and he discusses the challenges of making the complex show. He also elaborates on his relationship with Lew Grade and ITC, including his headaches dealing with their U.S. office, which constantly gave him notes regarding actor’s accents, use of monsters, and more. Disc 3’s The Last Sunset and Disc 4’s Space Brain get Text Commentaries, with shooting details and other factoids about scoring the music, set decorations, and special effects. Soundtrack fans will be excited to find Music-Only Tracks for all but two of the episodes. Those that are bigger fans of Season Two will love hearing that Disc 5 has the complete premiere episode of the second season, Metamorph, in bright and shiny high definition. 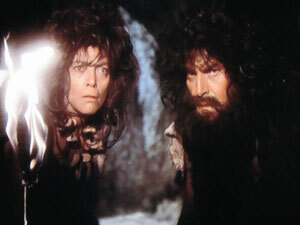 This episode shows the more action-oriented take on the show, with new cast members, including Catherine Schell as the alien shape-changer Maya. Brian Blessed guest-stars as Maya’s father, Mentor. That’s already a nice list of extras, but we haven’t even gotten to the bonus discs yet. Discs 6 and 7 each have a nice set of featurettes that fans will love, presented on standard DVDs. Featurettes may be selected individually, or you can choose to play them all in sequence. Featurettes are in the 4:3 ratio and some were produced in 2010. Disc 6 starts with the lengthiest bonus on the set, These Episodes (1:35:18), featuring over an hour and a half of reminiscences by Gerry Anderson, supervising editor David Lane, the show’s writing staff (Christopher Penfold and Johnny Byrne), and actress Zienia Merton (Sandra Benes). They discuss many specific episodes, but naturally offer a wide array of anecdotes (and even a little dirt). The many clips (at the very least) shown seem to have some PAL speed-up issues, but otherwise this is a wonderful set of interviews that places Season One in perfect perspective. Memories Of Space (7:50) has the same people discussing their experiences on the show in general. They all clearly appreciate that the show was about people, not super-people, with solid actors and stories. Fortunately, the other half of the Anderson team was not forgotten. Gerry usually gets spoken of the most, but his wife of the time was also heavily involved. The Sylvia Anderson Interview (16:13) begins with her discussing their film Doppelganger (aka Journey To The Far Side Of The Sun), which helps to make up for the lack of extras on Universal’s DVD of that film. 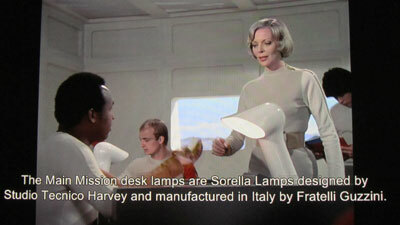 She then goes on to discuss UFO and The Protectors, before going into Space: 1999. It seems she shares her ex-husband’s remembrance of Landau and Bain, and reveals why Barry Morse really left the show (it rhymes with Mandau and Main). 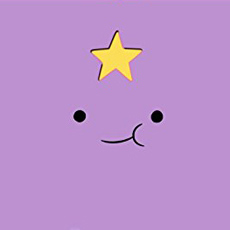 She also expresses that she didn’t care for what happened to the show after she left its production prior to the second season, where Fred Freiberger replaced her. Next, we get Textless Generic Titles (1:44), both opening and closing, before moving on to Concept And Creation (12:38), a Fanderson fan club production from 1996, where an interview with Gerry Anderson covers familiar ground. Despite the repeating of some stories, it’s nice to see something closer to vintage on the set. 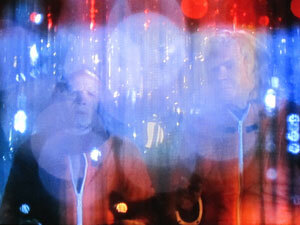 Writer Christopher Penhold and actor Barry Morse also appear. Similar to this is another 1996 Fanderson effort, Special Effects And Design (16:52), with writer Penfold, special effects director Brian Johnson, production designer Keith Wilson, and model maker & designer Martin Bower. It’s great stuff, and if it all ended here, I could have been very happy. But there’s more! 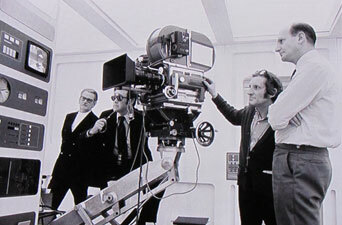 Disc 7 starts with a Clapperboard Two-Part Special On The Work Of Gerry Anderson, from 1975 (38:59). 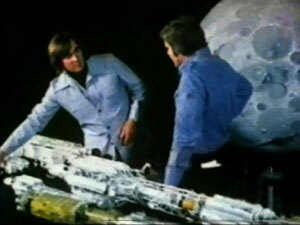 Host Chris Kelly interviews Anderson on his life’s work to date, on the Pinehouse Studios set of Space: 1999. A disclaimer warns that the broadcast master for this special no longer exists, so don’t expect great video. The interview itself, though, is priceless for Anderson fans. We get to see footage from some of Anderson’s shows, even including his ancient puppet cowboy drama Four Feather Falls. Anderson also handles an authentic Parker puppet from Thunderbirds, and discusses Fireball XL5 as his first space show and first U.S. sale. Interestingly, he mentions his preference to not use technical consultants, because they are limited by contemporary understanding of science, and therefore limit the imagination of writers. Model maker Martin Bowen gets interviewed as well, and part 2 of the show moves to the Bray Studio near Windsor, with more chat with Anderson along with special effects man Brian Johnson. Even though Maya doesn’t appear until Season Two, we do get a short interview with actress Catherine Schell, as she also appeared on a first season episode. In Guardian Of Piri Remembered (1:36), Schell discusses her provocative costume. Barry Gray’s Theme Demo (1:23) has Gray playing piano with some other instrumentation, underneath the show’s eventual opening sequence. Alternative Opening And Closing Titles (2:58) are shown for A Matter Of Life And Death, with the chief difference being the font used, while the closing credits feature production art rather than special effects photography. 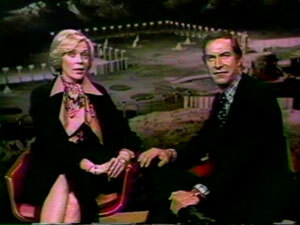 The Martin Landau And Barbara Bain U.S. Premiere Intro And Outro (1:54) may be a little cheesy, but it’s fun to watch. Less interesting (except maybe for those really interested in special effects photography) is Special Effects Plates and Deleted Special Effects (11:41), a pretty dry presentation accompanied by a music track. 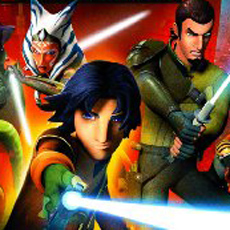 Then there are trailers for two movies that were produced using footage from the first season. There are three Alien Attack Trailers (3:36), and one Journey Through The Black Sun Trailer. Lastly, there are a set of Ad Bumpers (0:38). And that is how you handle a set for a cult favorite show. The only real fault with this set is the lack of a booklet with an episode guide. A & E Home Video provided one with their excellent The Prisoner set, so the exclusion here is disappointing. (The discs themselves have episode titles on them, at least.) However, they do address the one knock against the Prisoner set, and this time do provide a slipcover, though its not embossed and offers nothing different than the case’s cover. The thick Blu-ray case has three flipping trays, with no discs overlapping. There are five Blu-ray discs with the 24 episodes, and two DVDs for the bulk of the special features. 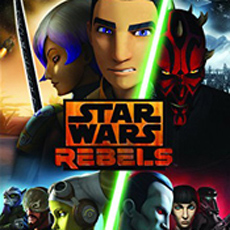 The Blu-rays are Region A locked. There are a generous eleven chapters per episode. Wow. Just wow. 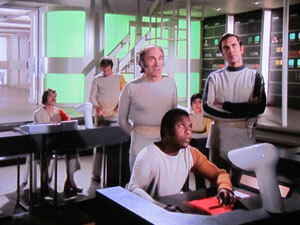 If this set doesn’t match the quality of A&E’s Blu-ray set of The Prisoner, it’s got to come pretty darn close. At the very least, it’s heads and shoulders above the Space: 1999 DVD releases, which looked surprisingly clean to me way back when, but seem dingy and almost blurry when compared to the new hi-def transfers. The original 4:3 frame is preserved in 1080p (unlike some cropped 16:9 broadcasts that have shown up in the UK). The biggest improvement to my liking is the intricate detail that can be seen in the wonderful models, but I also love the newfound cragginess in Landau’s face, and the beautiful vibrancy of the colors of planets and various space phenomena. The quality of the video really made me smile. It’s Blu-ray sets like this that make me realize that my collecting days will not be over so long as studios provide high quality hi-def upgrades. This is a very sharp picture, rivalling that of newer shows on the format. Thank goodness that these shows were edited on film and not tape. Based on these images, you can sign me up for any further Blu-ray upgrades of the Gerry Anderson shows, as long as the correct aspect ratio is observed (which it sadly was not in the UK’s Thunderbirds Blu-ray set). The audio, while not quite a revelation, is very nice indeed. The sound recording seems to suffer just a bit from its dependence on the technology of the time, but only the biggest audio nuts would have reason to frown. The best news to report is on the new 5.1 mixes. Upon hearing the new mixes, I could never go back to the original mono tracks, which are also provided for the consideration of purists. The 5.1 mix is far from gimmicky, broadening the sound field nicely and enhancing the action with tastefully placed effects. Just listen to the opening theme and compare tracks, and I’d be amazed to find anyone who favored the cramped and listless mono track. Between the spiffed up video and the lively new audio, it really is like watching the episodes for the first time. As I mentioned already, there are also music-only tracks for all but two of the episodes. Unfortunately, no subtitles are offered. You could not ask for a better handling of a cult favorite. The enhancement of a new hi-def transfer, surround sound, and brilliant bonus features that place it all in context makes this a set that should bring new appreciation for this often disregarded sci-fi classic. 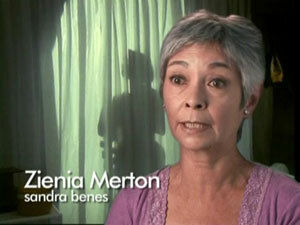 (The only deficiency is the lack of actor participation in the special features, aside from Zienia Merton.) Old fans will delight at the sparkling new presentation that bests what we saw in the 1970s, while new fans (or those previously on the fence) will hopefully find a new willingness to give the show some proper respect. In retrospect, aping the look and feel of 2001 may have been the series’ only misstep, as it set the wrong expectations. Just listen to its bombastic opening, which seems designed to make you think of 2001’s use of Thus Spoke Zarathrusta. This is not a “hard science” show by any means. Instead, it focused much more on the metaphysics and philosophy that were also seen in 2001, while adding a fair dose of action and alien yet fascinating ideas. The reach of the show often extends past its grasp, but there has never been a show quite like it. Season One in particular stands apart from its more Trek-y second season, though I also greatly look forward to seeing Season Two treated right on Blu-ray.